It was Abigale’s birthday this week, and boyfriend Simon planned a romantic surprise. He would sneak into her apartment while she was at work, and fill it with flowers. He could see it in his mind’s eye; roses in a vase on the coffee table, roses on the mantle piece, flowers in a jam jar in the bathroom, flowers in the kitchen in an old glass milk bottle by the sink, petals on the bed. It would be the ultimate romantic surprise. Sadly, New York eliminated the possibility of sneaking-related grand gestures, when Abigale never quite got round to giving Simon a key. First stop, the doorman. Simon turned up with armfuls of foliage and was told that he could not go up. No matter that he had been practically living there for the last few weeks, and had talked about football with the doorman every time they had crossed paths. He was officially a stranger and could not enter. He considered the fire escape. But the ladder was too high to reach no matter how high he jumped. Stumped he sat on the stoop with his flowers and wondered what to do. Which, as luck would have it, is when I called to see how the Crime Passional was going. He paced up and down in my apartment while I put the kettle on, gingerly navigating the flowers that we had dumped in the sink to keep fresh. “Romance is trickier than I thought,” he said. Which is when we decided to bake chocolate cakes. Now Simon’s chocolate cake, decorated with some exceedingly cool candles with multi colored flames, was a birthday cake through and through. 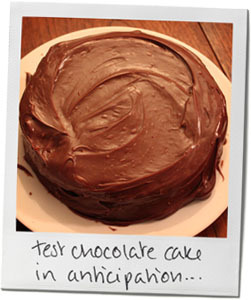 But my chocolate cake was a test drive towards an entirely different goal – a Sneak Like A Ninja Day cake. Sunday is coming. I will be getting my sneak on. I hope you’ll be joining me, though, of course, if you sneak properly, I won’t even notice. And I was talking to Jonathan about my menu (sushi for the Ninjas and pizza for the Ninja Turtles, all washed down with Lychee Martinis). What did he think Ninjas would eat for desert? He sat, deep in thought for a moment then nodded sagely. “Pirates” he concluded. 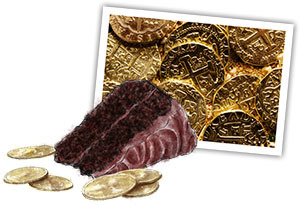 So my chocolate cake is topped with treasure that the Ninjas stole from their arch rivals when they were off drinking rum and polishing their cutlasses. I have gold chocolate coins, candy necklaces, jelly sweet rings (thank you Dylan’s Candy Store). I have edible gold spray (Williams Sonoma) and some silver and gold wrapped Godiva truffles – because they are so beautiful. 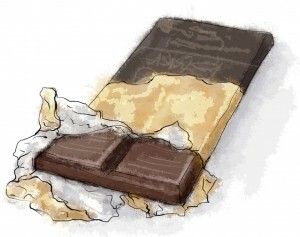 Piled on top of a deep rich chocolate icing, it’s a cake any Ninja would be happy to partake of. So if you bake one, turn around and find nothing but crumbs left on the plate, you’ll know what happened. This entry was posted in This Dinner Will Get You Laid and tagged baking, cake, chocolate, chocolate cake, icing, ninja, ninjas vs pirates, pirate, pirate treasure, sneak like a ninja day. Bookmark the permalink. And to think, I have never heard of “Sneak Like a Ninja” day.